Engine must be off for at least one minute before checking oil. Pull the dipstick out, and wipe it off with something clean. Put the dipstick back in and wait about 5 seconds. Pull the dipstick out, and observe where the oil is on the dipstick. It should be on the 'F' line for Full. Anywhere between the 'F' and 'L' marks is safe to drive. Note, very high oil level is just as bad, if not worse, than a low oil level. G - Models...Open the engine compartment door and observe the sight glass right in front of your face. If you don't see anything in it, you need coolant. If you see coolant in there, -rather it is blue, red, green, or purple- then you are good. The sight glass does not have to be completely full. D - Models ...Open the engine doors, then open the radiator door. Turn on the engine service lights, hopefully the one by the sightglass is working ok. If not, get a flashlight and write up that light being out in the M7. The sight glass is located way up at the top, above the radiator fans. (see photo at bottom of this page) If you see coolant in it, you are good. Even if it is only halfway up the sightglass, you are still good. If you don't see any coolant, look for the "manual coolant pump" switch, located near the rear start switch and service light switch. Push the switch down and you should hear a pump kick in that will pump coolant from a holding tank up to the radiator surge tank. If you don't hear it, it doesn't work, write it up in the M7 book. If you hear it, but after awhile the sight glass isn't getting any fuller, then check the lower coolant tank, located behind the RH service door. Open the lid and see if there is any coolant in there. If there is, the pump needs bled of air, write it up in the M7 book. If there is no coolant, then there is no coolant, write it up in the M7 book. Don't use the coach if it has no coolant. The sight glass is located up top again, like the D-Models, though not as high. It is just above the Engine fan box. 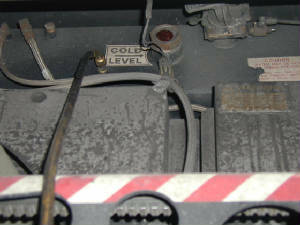 The coolant level should be visible in the sight glass. Again, it doens't have to be completley full. If there is no coolant visible in the sight glass, inform maintenance or write it up in the M7 book. If you see coolant, you are good to go. MC-12 and D models have a sightglass on the power steering resevoir located behind the alternator on the D model and right in front of your face on the MC12, usually right above the engine oil dipstick. Basically, the sight glass should be all black, or half black. This sightglass does not have to be completly full either. Halfway is plenty. If the sightglass is halfway full, then the power steering resevoir is about 1/4th of a quart low. G45's have a plastic resevoir located either to the far right at about eye level in the engine compartment, or in the RH side service door to the left. It has a line on the resevoir to tell you when it is in the right level. It also has a dipstick. You should use the sight line method. You may have to wipe off the resevoir to read it, but on there will be two lines, one to tell you if it is underfull and one to tell you if it is overfull. If it is low or high, write it up. To check transmission fluid, the engine must be running, on LOW IDLE (not fast idle) in neutral, and operating temperature. In buses with a digital gear selector, simultaneously press the up and down arrow keys. The gear selector should display...O L , O K.
That means Oil Level is OK.
That means Oil Level is LOW 2 quarts. You may see other codes, like 77, or you may see it flash 55555, 44444, 33333, 2222, 11111....this is a countdown. It means that when you pressed the arrows, it wasn't ready to give a trans fluid reading yet and will count down, then give you the reading. If you can't handle the electronic check, which is really quite simple, then you can still pull the dipstick and check it like an MC12. again, ensure engine is running at low idle, and you are at operating temperature. Open the Left hand side service door, pull the dipstick, wipe it with something clean, put it back in for about 5 seconds. Pull the dipstick out and note the oil level on the tip. It should be in the SAFE range between the two lines. Sometimes it is hard to see the red transmission fluid on the copper dipstick tip. Also note, the safe range is rather large. located in the surge tank, above the radiator. Coolant level sight glasses and Power Steering resevoir sight glasses are suppose to filled to the midway point of the sight glass. Not to the top.Basically, if you look at the sight glass and see fluid, it is ok. If you see nothing, it needs topped off. the new coolant being used by maintenance is Blue. Performing a Pre-Trip inspection of all fluid levels is critical for ensuring a safe, pleasant trip. It takes just a few minutes, and can save you hours of sitting along the side of the road. Maintaining proper fluid levels also ensures maximum engine life, and maximum horsepower. All drivers want that, help maintenance give you that by performing a proper pre-trip and post-trip inspection.